What are we preparing for? 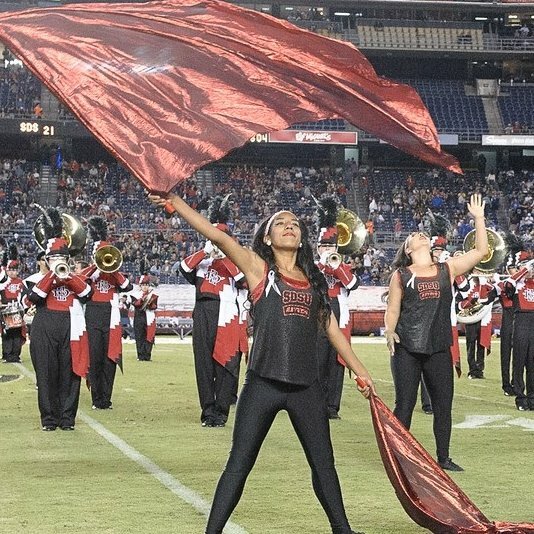 Performances at the SDSU Aztec Football games! Our game day festivities start with Warrior Walk and end with an encore performance for our alumni outside of the SDCCU Stadium. Our Aztecs' home stadium, formerly known as Qualcomm Stadium or Jack Murphy Stadium, seats up to 70,000 fans. With three tiers of seats and lights that illuminate the field, performances can be intimidating. To better prepare ourselves, we will join the band for one rehearsal in the stadium; rookies visualize the depth and height of the stands from a performer's view, and vets reminisce on the excitement in performing in front of thousands of people. We have already rehearsed for over 72 hours in the last 9 weeks, but our work is far from finished. Starting this Monday, we begin our color guard and band camp, which totals to another 90 hours of reviewing, rehearsing, and refining our routines. But this camp will not revolve around technique and choreography completely. As Coach Michele always says, "We want you to become better performers in this guard but an even better person afterwards." Several San Diego State University departments will hold workshops for us, from exploring our resources like the Women's Center to better managing our stress levels from Counseling and Psychology Services. Lauren, a 3rd year vet and captain for fall season, says that she's most excited for "bringing everything together" from the first rehearsal to our first performance. With all of our time during camps, we will be ready to perform! Join us on September 8th for the Aztecs' first home game and the annual KGB Skyshow! Member Spotlight with Liz Tapia! Let's Meet Our Staff Assistant and Super Vet, Liz Tapia! How did you get involved with SDSU guard? How many years have you spun with the guard? An old alumni (Vania) reach out to me after I graduated high school. She had mistaken me for my twin, and I'm glad she did! I've been doing this since summer of 2011 - so 7 going on 8 years! What makes you come back year after year? I love watching performers go from rookies to vets! They continue to go above the set standards, and it's really exciting to watch everyone grow. There were many moments during my winter guard seasons here that made me wonder if we'll recruit enough people to even keep a competitive team going. Once Michele came in fall of 2014, I knew things were only going up from there. When Michele put me on staff as the Staff Assistant, it was a win-win for me. I get to perform in the fall, and be on staff for winter. I definitely love all the bowl games and Charger games that we performed at. We have been to the Poinsettia Bowl Game here in San Diego about 3 times, but being able to travel to Fort Worth, Las Vegas, and Idaho are the most memorable experiences I've had with the guard. Nothing beats traveling with your team. How have the dynamics changed since when you first joined? Drastically in the best way possible. Everyone always wanted to be good and have fun, but it never really clicked as a team about how good we wanted to be. Now everyone has the same goal, and we're all ready to go and everyone is communicating effectively on how we're going to do it. It's a much more positive and progressive dynamic. What are your hopes for our performers this year? To see how much they've grown throughout one season. They won't know it yet, but they're going to grow so much, both as better performers and as better people. And not just like "do this toss" or "do this trick" by the end of the season. But understanding what your body needs to do as a performer, and how to work as a team and having communication with others as a member of this team. What advice would you give to a rookie and someone wanting to march with a college color guard? Perform to point 4, just kidding! At this level, it may seem scary and hectic at first, but it's like going on a roller coaster - all roller coasters are better with friends! The friendships you make here are irreplaceable, and the memories you make are unforgettable. Don't have any self doubts, come in with a can-do attitude, and remember to always have fun! Because everyone else is doing the same. We are always in need of support from friends, family, alumni, and community businesses. If you are interested in sponsoring the Aztec Winter Guard through a monetary donation or another way, please visit the donations page.